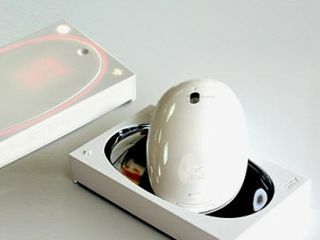 New concept phone: is it an egg? Pantech, the Korean mobile phone manufacturer, has enjoyed some worldwide success over the last year, winning contracts in the US with AT&T, but it still has kept an eye on its roots be showing off a slew of new concept phones. The ideas were dreamt up by the Pantech Design Community, which allows 20 college students to let their mobile minds wander (not in an out of body sense, just in terms of phone design). The craziest of the lot is the Softy Lofty, which seems to be a twisty egg on a plate rather than a handset. It's designed "to offer as much visual and emotional comfort as possible", and emit a vague glow when charged. What's a vague glow? Other handsets include the Easter Moia, which has a wave touchscreen LCD and loads of keys on the side, as well as a weird dock that makes it look like a microphone. The Coralliform Water (you've got to love these names) is what you'd call a 'proper' concept phone, with the lime green keys that Nokia loves to plonk on all its futuristic designs. Check out Unwired View's gallery of all the handsets and decide for yourself whether these should be made into things we put in our pockets in real life.